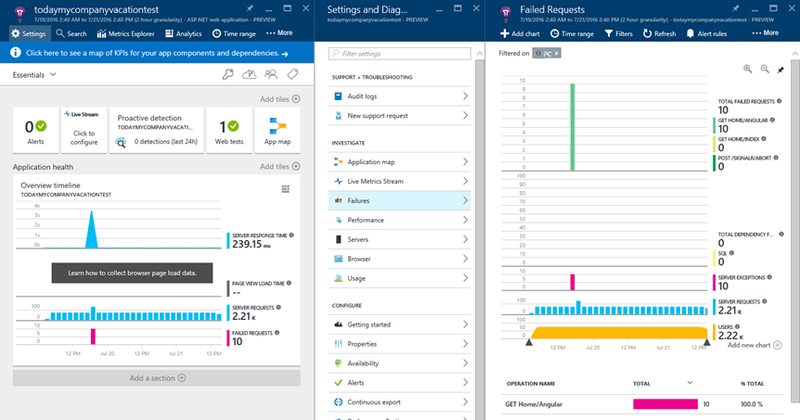 Just over a month ago, I announced a new feature set for Application Insights: work item integration with Visual Studio Team Services. Today, I have more good news for those trying to integrate their analytics into their workflow. We just finished work on a similar experience for GitHub. In a matter of minutes, you can configure your Application Insights resource to write issues containing valuable Application Insights data directly to your GitHub project. Click on this, and the configuration blade for work items will open. Note that the “Tracking System” drop-down at the top of the configuration blade is now active and has two choices, one of which is GitHub. Choose GitHub. Then all you need to do is fill out the URL that maps to the GitHub project you want to connect. Once that information is in place, you can click on the Authorize button, where you will be redirected to authorize access in your selected GitHub project so work items (issues) can be written there. Note: If you are not already logged in to GitHub, you will also be prompted to do so at this time. Once you’ve completed the authorization process, click OK. You’ll see a message stating “Validation Successful” and the blade will close. You’re now ready to start creating issues in GitHub! Creating work items from Application Insights is very easy. 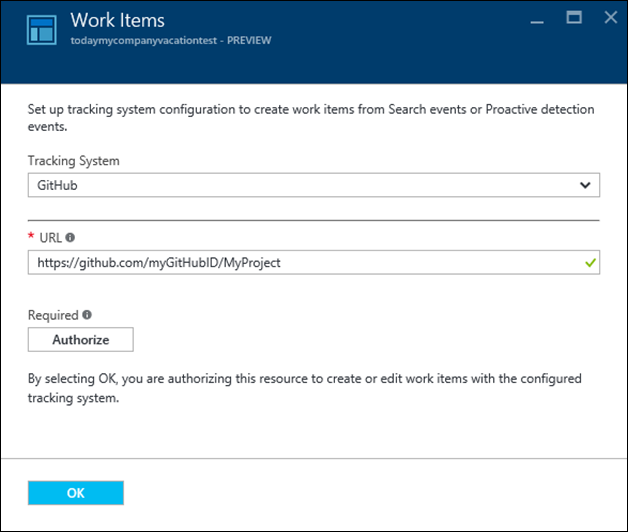 There are currently two locations from where you can create work items: Proactive detection and individual instances of activity (i.e., exceptions, failures, requests, etc.). I will show you a simple example of the latter, but the functionality is identical in either case. 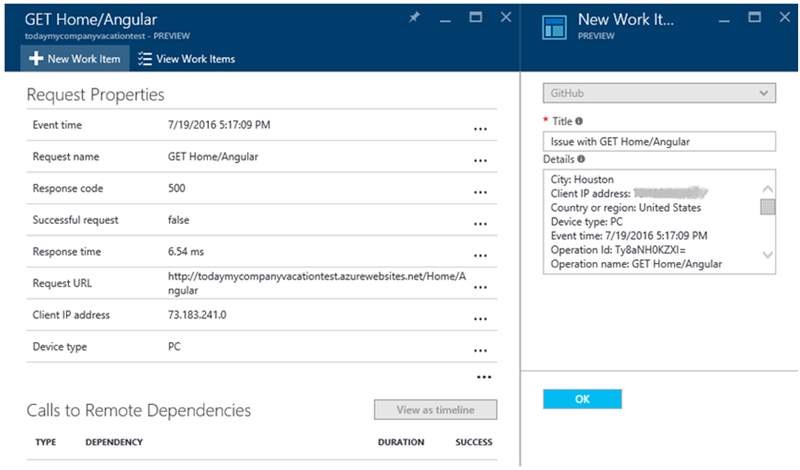 In this example, I’m looking at a test web app I published to Azure. I started to drill into the activity for this app by looking at the Failures blade (but we could also get to this same information through the Search button or the Metrics Explorer). We can see I have a number of exceptions that fired on this web app. If I drill into this group of exceptions, I can see the list and choose an individual exception. Looking at the detail blade for this exception, we see there are now two buttons available at the top of the blade that read “New Work Item” and “View Work Items.” To create a work item, I simply click on the first of these buttons and it opens the new work item blade. As you can see, just about everything you need in your average scenario has been filled out for you. All of the detailed information we have available for this exception has been added to the details field. You can override the title if you wish, or you can add to the captured details. When you’re ready to create your work item, just clicked on the “OK” button and your issue will be written to GitHub. Once you’ve created one or more work items in Application Insights, you can easily view them in GitHub. 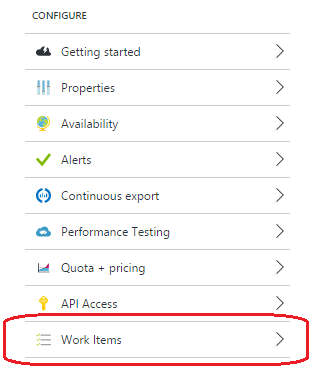 If you are in the Azure portal, the detail blade for the event associated to the work item(s) will have the “View Work Items” button enabled. To see the list, simply click the button. 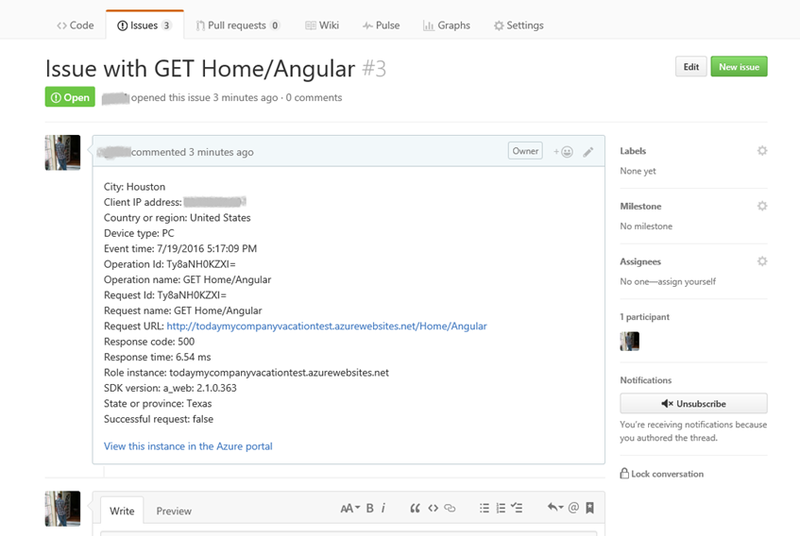 Note that the issue has a link at the bottom that will allow users viewing the issue in GitHub to navigate back to the Azure portal and Application Insights. That’s all there is to it! As you can see, this functionality is very easy to set up, and creating issues from Application Insights is a snap. As I detailed in my previous post about VSTS work item integration, we have a lot of future plans for improving this functionality. Completing the integration with GitHub was part of our “support for other ALM systems” goal, and we’ve also delivered on our goal of “links back to Application Insights” (this capability has also been added to the VSTS work items created from Application Insights). This is another great milestone for this feature set, but we still have a lot of goals ahead of us, like the ability to set up multiple profiles, automatically create work items based upon events, and adding other source points for creating the work items (e.g., alerts). We will continue to improve and evolve work item integration to allow for more flexibility and more seamless integration into your everyday workflow. 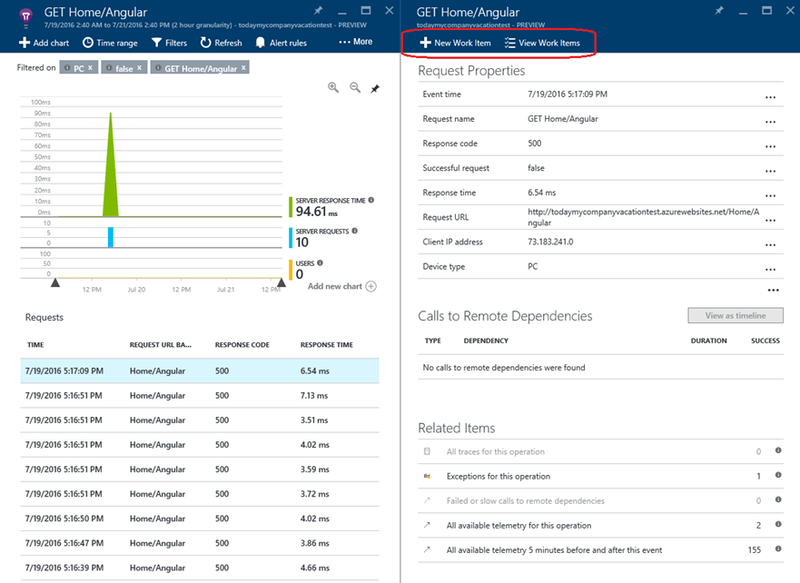 As always, please share your ideas for new or improved features on the Application Insights UserVoice page. 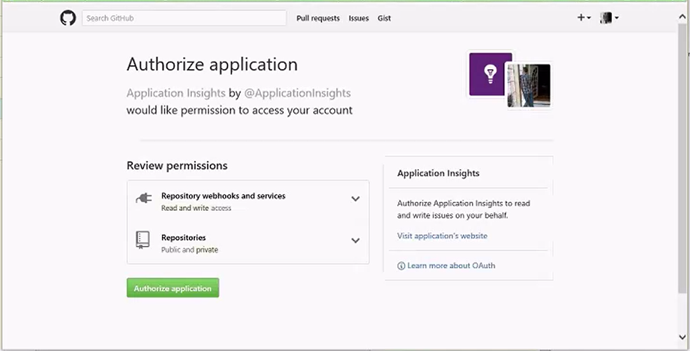 For any questions visit the Application Insights Forum.